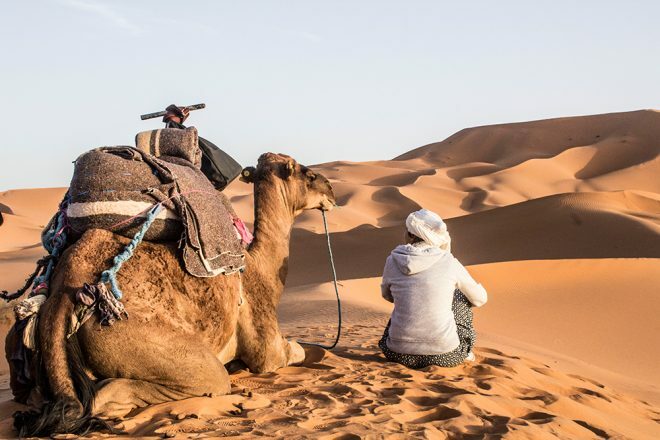 While planning our trip to Morocco, there was one experience we really wanted to have in the country, and one that is a must: to spend a night in the Sahara Desert. The challenge was to decide where to fit it in our itinerary, since geographically the desert is far from all the main cities we were visiting. We also didn’t want to do it as a day trip, it would have been too much for a short time. 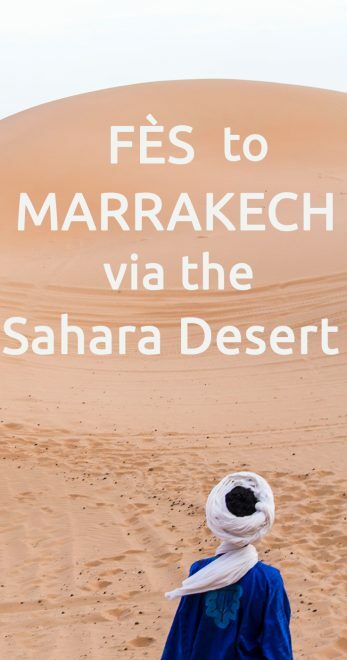 After months of planning, we decided that the best alternative for us was to do it at the end of our trip, on our way back from Fès to Marrakech, where we began and finished our Moroccan adventure. 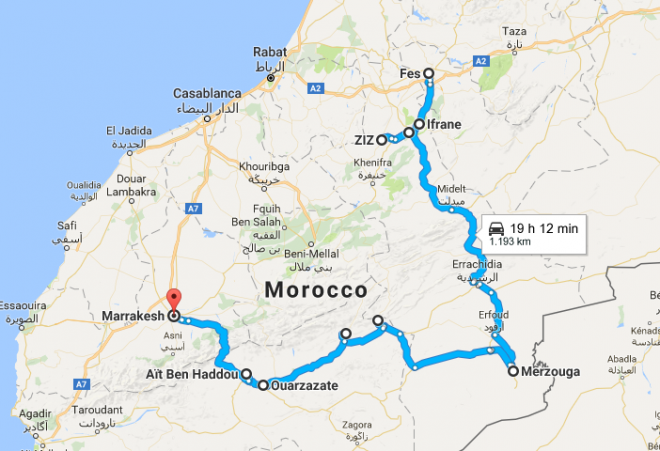 The next challenge was to find a company that, first, offered our desired route, as the most common way is the opposite, from Marrakech to Fès. Second, it had to be a company that we liked, trusted and had great reviews from other travelers. After some research and getting in touch with a few companies, we chose Mouhou Tours. We were very happy with our choice and had an incredible experience with them. 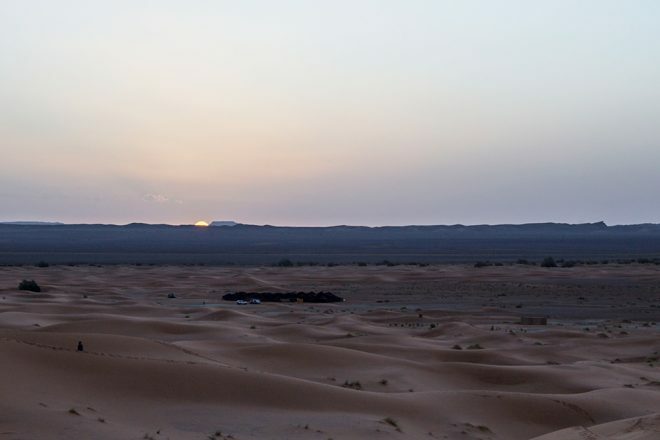 Even though the most awaited moment of the trip is the night in the desert, the entire route is spectacular, and it makes it clear how diverse Morocco is. On the same day you experience a place incredibly similar to Europe, spot snow in the mountains, valleys of palm trees, then you are in the desert. This route is unbelievably stunning and photogenic, with scenic views, and with landscape and weather contrasts. An experience of a lifetime. The day started early with our driver picking us up at our accommodation in Fès. 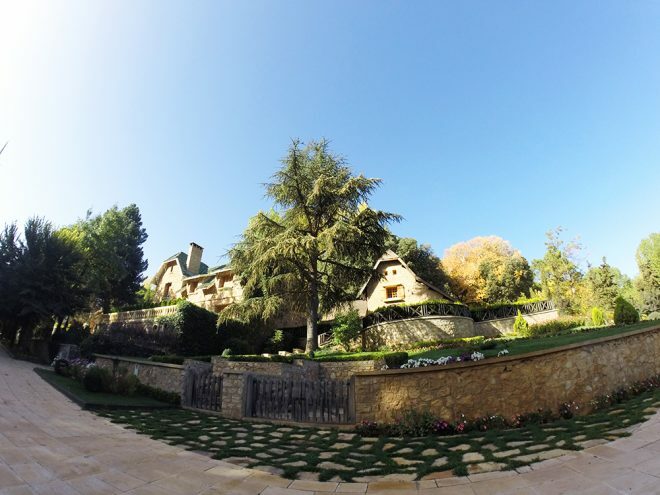 The first stop was at Ifrane, a beautiful village that for a moment makes you feel like you’re not in Morocco, but in Switzerland. There, the houses are build completely different, the reason is because during winter it may snow a lot in the region, making it a popular destination for ski. 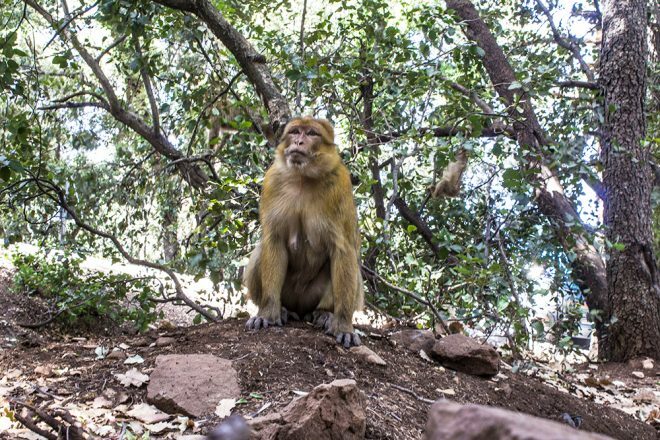 The second stop was the Azrou cedar forest, where it’s possible to interact with wild and very friendly monkeys in their natural habitat. Tip: bring healthy snacks for the monkeys, such as fruits. After hours driving through incredibly scenic roads through the mountains, where even snow can be spotted in Midelt, there was a stop for lunch, in one of the only places available. In the middle of the afternoon we arrived at Ziz Valley, where we had one of the most beautiful views of the trip. 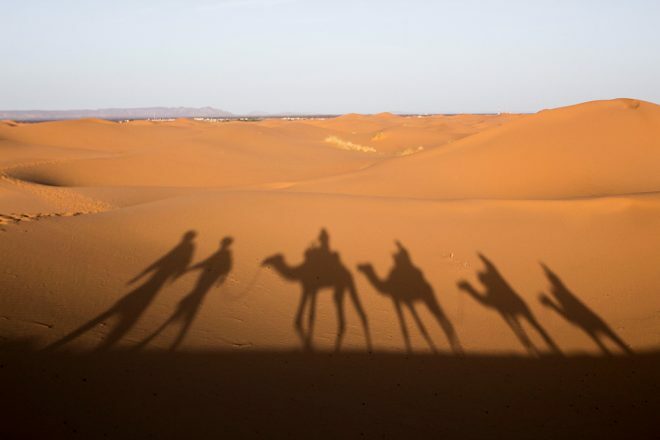 After a section of pictures and videos, we headed to Merzouga, from where we took the dromedaries to reach our tent in the Sahara Desert. 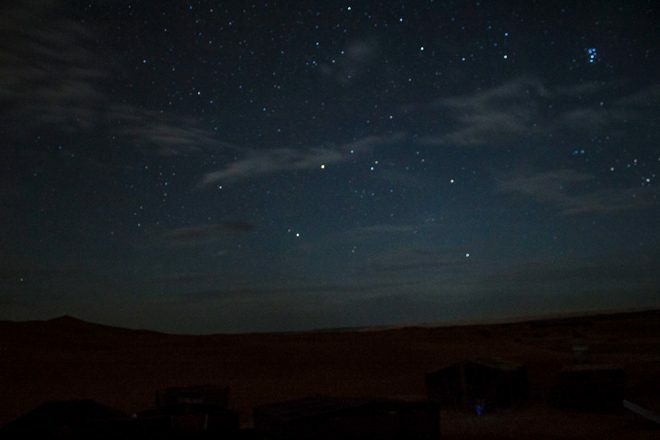 We faced a sandstorm and rain, had dinner and heard the Berbers sing and play in the tent, then we lay on the sand to star gaze, when the clouds let us. After watching the sunrise from the dunes, we made our way back to Merzouga, where we took a shower, had breakfast and continued our way. This day we spent less time in the car and had more time at our stops: the gorgeous Todra Gorges and Dades Gorges. The first was our favorite, what a breathtaking place! Then we headed to Dades Gorges, where we watched the sunset from the terrace of our Riad. 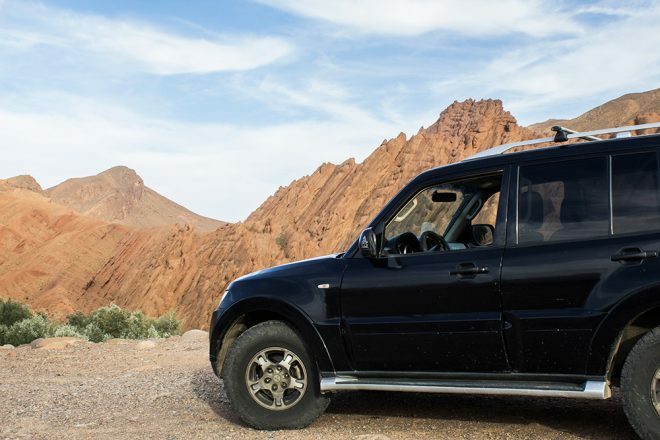 From Dades Gorges, we made our way to the Moroccan Hollywood town of Ouarzazate. We took the time to visit the Cinema Museum, where you find a lot of information about the movies set in the region. 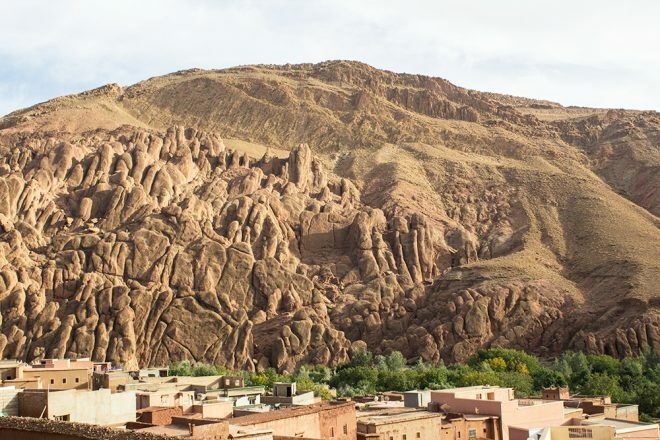 Then we headed to the peculiar and incredible Aït Benhaddou, a UNESCO protected site, only a few kilometers away, where many movies such as The Gladiator and Lawrence of Arabia were filmed, as well as some part of Game of Thrones. 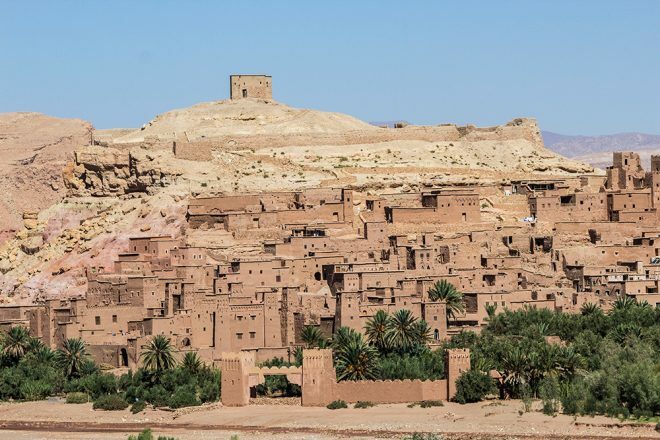 The Kasbah, or citadel, is made of sand, and it looks like it came out straight from a fantasy book. Curiosity: whenever filming is taking place in Aït Benhaddou, the citadel is closed and all inhabitants are directed to the other part of the city. In many movies, the locals also take part, acting as extras. 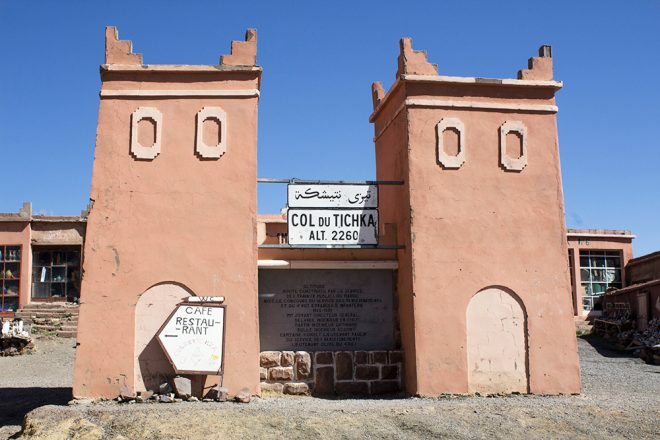 Our last stop before heading back to Marrakech was at 2260m high, in Tizi N’Tichka in the Atlas Mountains. 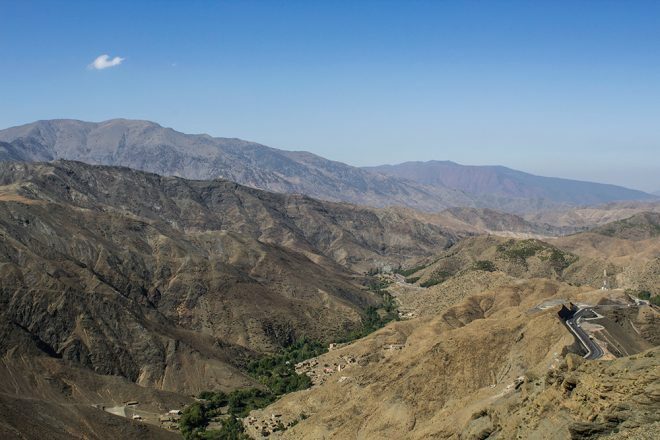 It is the highest point you can get by car in the mountains, with gorgeous and breathtaking views over the valleys. Our adventure finished in Marrakech at around 6pm of the third day. There we spent one more night and took a flight back home the next day. Which are the essential items to bring? ♦ A small backpack: to take the basics, since you won’t be taking your luggage with you to the camp. ♦ A bedouine headscarf: if you don’t have one, try to get it on the way to Merzouga, ask your driver to take you somewhere to buy one. It might not seem important at first, but you will be thankful to have one while riding the dromedary, especially if you experience a sandstorm like we did. ♦ Camera and tripod: essential items to capture the night sky. ♦ A hoodie/jacket: when they say it can get cold at night in the desert, believe it. In October a jacket or a hoodie is fine, no need for a winter jacket. ♦ A second outfit to change. ♦ Toilet paper and wipes are recommended. Do you take your luggage to the desert camp? No, you leave everything you won’t need in the desert at a Riad in Merzouga, where your driver will pick you up the next morning. Take only the necessary (hence the small backpack) for the tent. Your stuff will be locked in the room you will get at the Riad, where you will be taking a shower and having breakfast the following day. 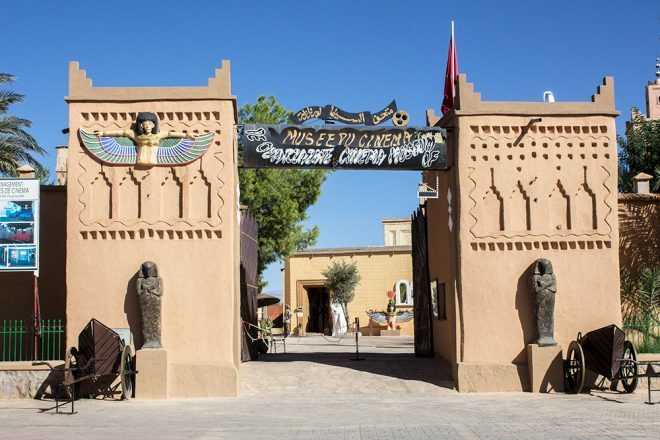 How is the way from Merzouga to the camp? 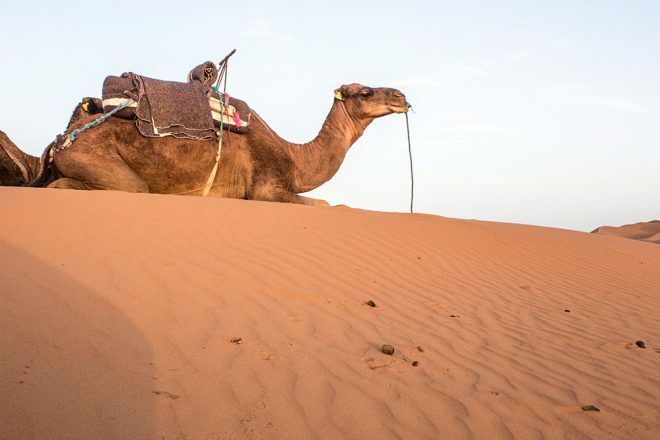 It is a 1,5-hour dromedary ride to the camp through the dunes. With ups and downs along the way, and possible rain and sandstorms (which was our case). 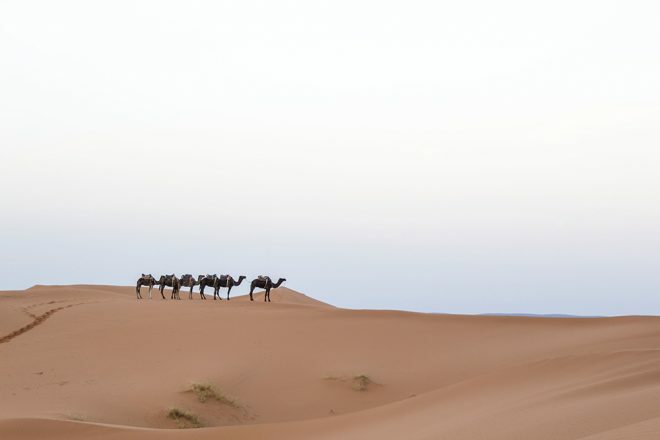 You will be guided by a Berber, who will stay in the camp as well, to take you back to Merzouga the following morning. How is the camp and tents? There are quite a few camps near where we stayed. To our surprise, our camp had electricity (from a generator), toilets, and beds! So if you’re wondering if there are bathrooms (no showers) and beds, the answer is yes. Of course, I can only speak for the camp we stayed at, which belongs to Mouhou Tours, I’m not sure about how others are, but my guess is they are very similar. 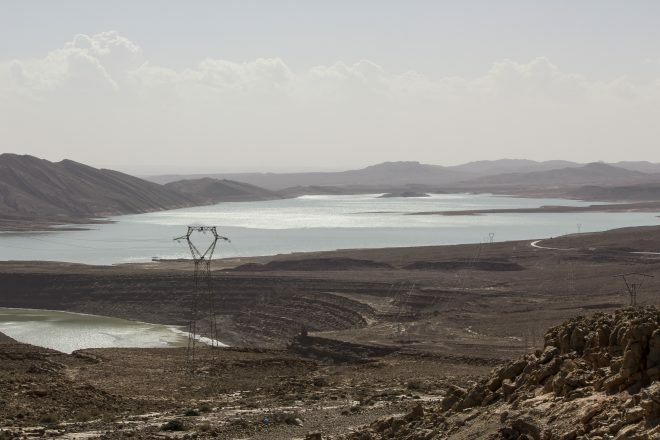 ♦ The shocking contrast of landscapes along our way, where we experienced high altitudes, the desert, snow in the mountains, views over valleys of palm trees, sandstorms, rain, hot days, inhabited places and more. ♦ The sandstorm in the Sahara Desert! It was a crazy and fun experience to keep in our memories forever. 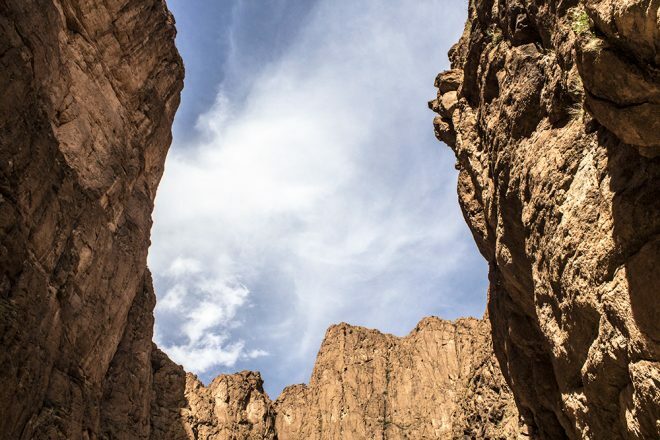 ♦ The views of the Ziz Valley and the Todra Gorges. ♦ Walking through Aït Benhaddou and feeling like we were in a movie. ♦ We loved the fact that our driver always tried to take us to less touristy spots and views, and was always happy to explain us about the places and answer to our questions. 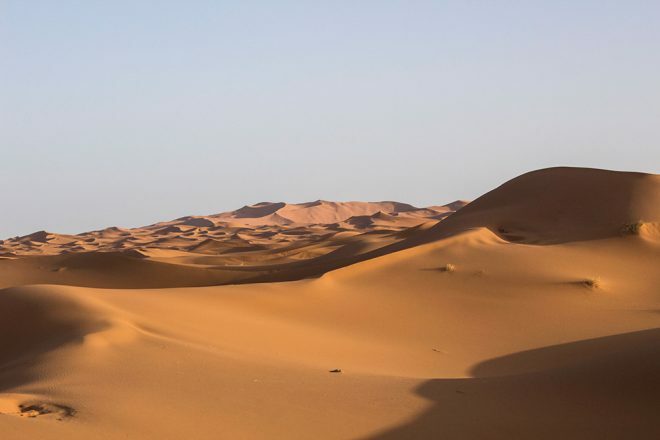 ♦ There are two famous desert dunes in the Moroccan Sahara Desert, the most popular, touristy and affordable Erg Chebbi, which is next to Merzouga (our chosen dunes), and there is also the more secluded and less touristy, but also more expensive one, Tinfo, which is next to Zagora, more to the south. ♦ You may take this trip as you want, as Mouhou Tours can organize it to meet your needs. So in case you want to stay longer in each place, it’s possible, we met some people that would stay 2 or 3 nights in the desert camp. 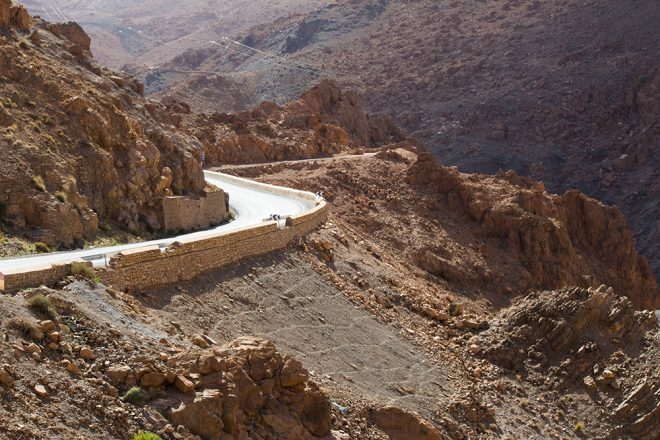 They also organize trips all over Morocco, not only to the desert. ♦ Don’t worry, if you want to make stops for pictures along the way, the driver is always happy to stop and give you some time. ♦ Your driver will be with you for 3 days, and you will be spending a lot of time together, so it’s very important that you’re happy with him. We were incredibly happy with our driver, and even missed him after the trip. Check out our favorite moments in one short video! Thank you Mouhou Tours for the incredible experience! We partnered with Mouhou Tours to make this adventure possible in October 2016. As always, views and opinions are my own, and I only recommend what I like and believe my readers will like too. The photos are fantastic. Really seems like a trip of a lifetime, even though I remember your mixed reviews. Marrakech and this trip to the Sahara Desert were our favorite parts of the trip!! The first day of the route was very tiring, but definitely worth it, I wish we could have stayed longer in some of the places, but we didn’t have enough days to spend!